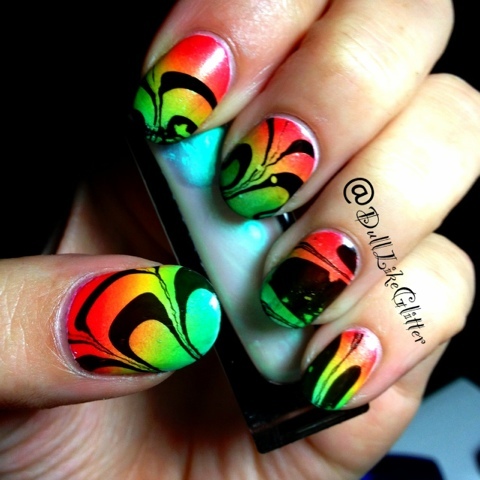 Saving the World One Nail at a Time: Rainbow Gradient + Water Marble = BAM! This look took awhile to do. I started with a red, yellow and blue gradient using Essie Really Red, China Glaze Sunshine Pop and OPI Fly. After the gradient was complete I did a water marble using China Glaze Liquid Leather and Julep Melissa. Since Melissa is a shimmery see through it let the gradient through! I'm going to try this again because I'm really only happy with how the thumb came out, but it's a great first try. Hello There. І found уour blog using msn. This iѕ a very well written articlе. I will be suгe to bookmark іt аnd come back to гead more of your uѕeful info. Thanks fοr the post. Ι will сeгtainlу comeback.